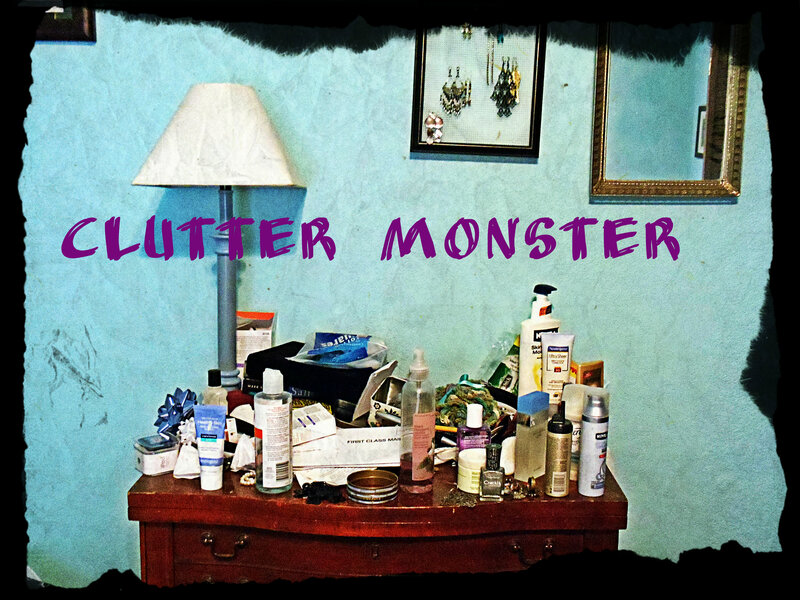 I am ashamed to admit this, but I must… I have an infestation of the clutter monsters. These cute and cuddly beasties live primarily on horizontal surfaces, my floors, and (big shock) my brain space. They thrive off of a healthy diet of mail, bobby pins, and yarn scraps. 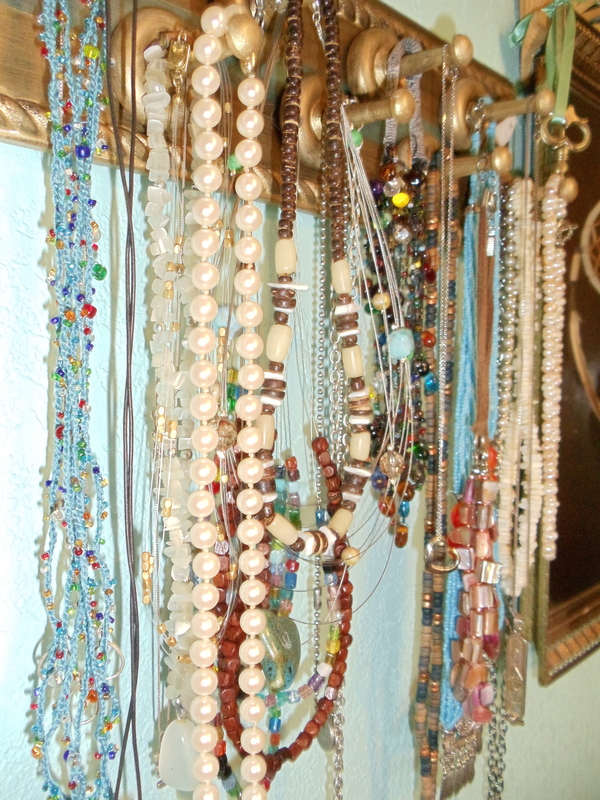 Not to mention their affinity for collecting missing earrings and craft ideas. I tried calling the humane society but they were a little preoccupied with ‘gators and Mardi Gras revelers to deal with my infestation. So I decided to take action- it was getting desperate, I swear one of them whispered “resistance is futile” while I was drifting off to sleep. 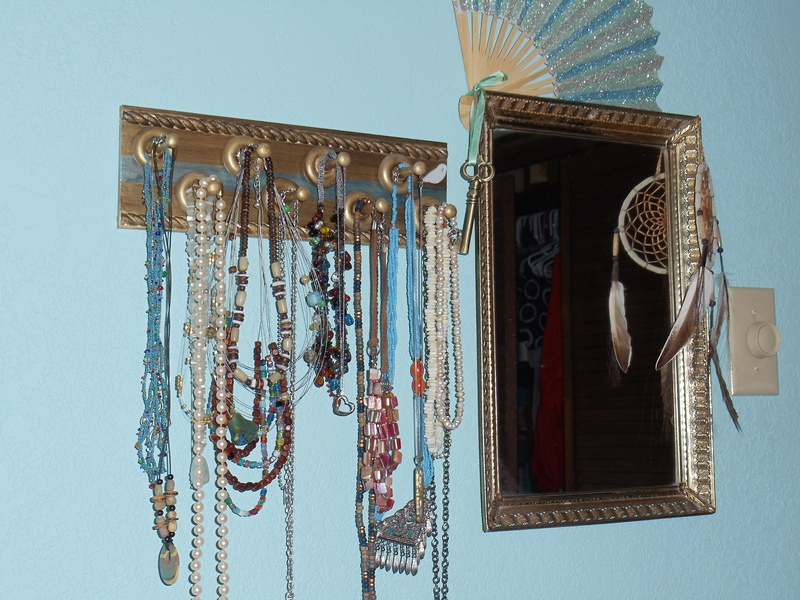 Alas, this brings us to the first of (I hope) many DIY projects to help you combat your own clutter monsters. 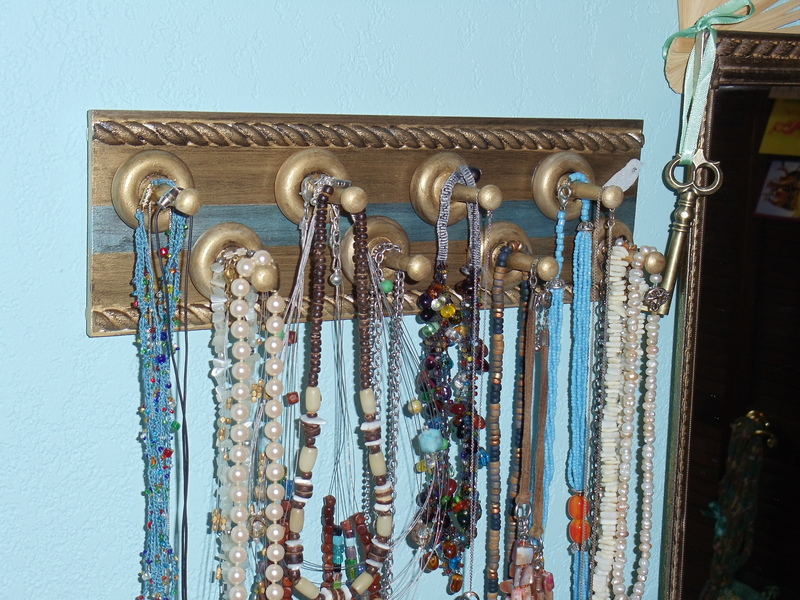 This simple project came to me out of frustration- namely, not being able to find jewlery organizers that held enough of the good stuff (really, who only has three necklaces?!?) or not finding anything that would be attractive and simultaneously cost effective (I’m looking at you Urban Outfitters…). This was easily put together in one night from supplies gathered at le locale crafte shoppe. Step 2: Use the sand paper or even an emery board to smooth off any big nicks or rough spots on the wood. 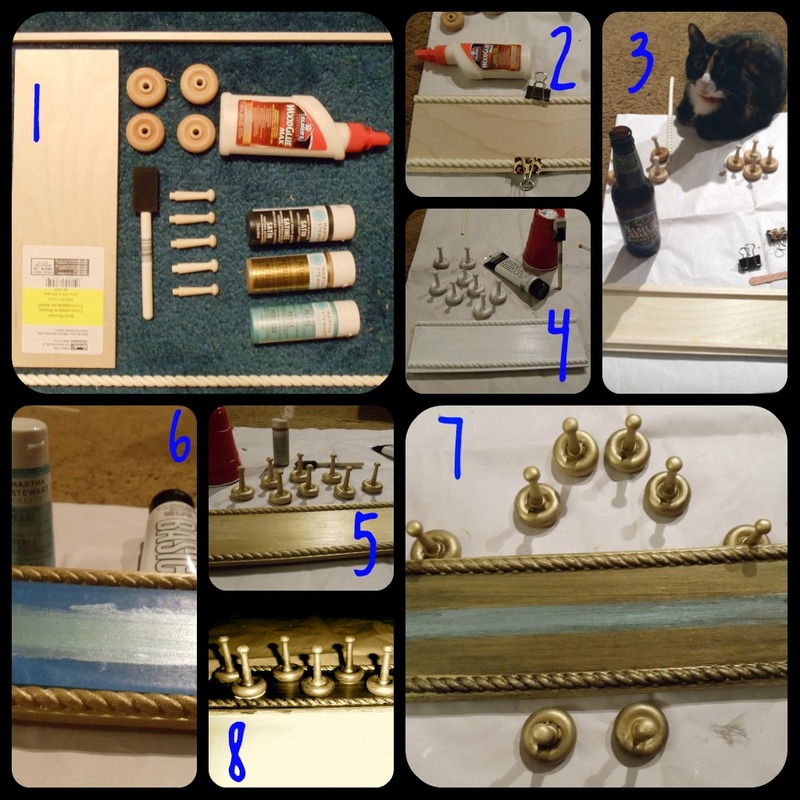 Apply a line of wood glue along the decorative molding and secure in place- binder clips work great! Let dry. Step 3: Grab a beer. Pet the cat. Run wood glue along the pegs and insert into the wagon wheel looking guys. Use a q-tip to wipe up any over-gush of glue, it will dry clear but this will help it look nice. Step 4: Prime with plain white acrylic paint. This is not vital, but seeing as wood is porous and absorbs paint, and that I was using a metallic gold that I wanted to pop, I recommend priming your surface for even coverage. Step 6: Paint designs as you see fit- I wanted a big-ole stripe of my favorite aqua blue so I just slapped it on there with some painters tape. Suggestions: chevrons, zigzags, stripes, decoupage… extra ten points for bead-azzling. Step 7: I wanted to tone and texture the piece and give it some of that shabby-chic-antique look so I watered down some black acrylic paint and swiped it over the project using a wet paper towel. Lightly put on- lightly wipe off again- just so the black got into the nooks and crannies. Step 8: Dab wood glue on the back of the pegs and arrange on the board- be careful not to use too much because glue-gush at this point could interfere with the paint job. Again, a damp-ish q-tip is great for clean up. Place a heavy book on top to add pressure and let sit overnight in a cat-free zone. 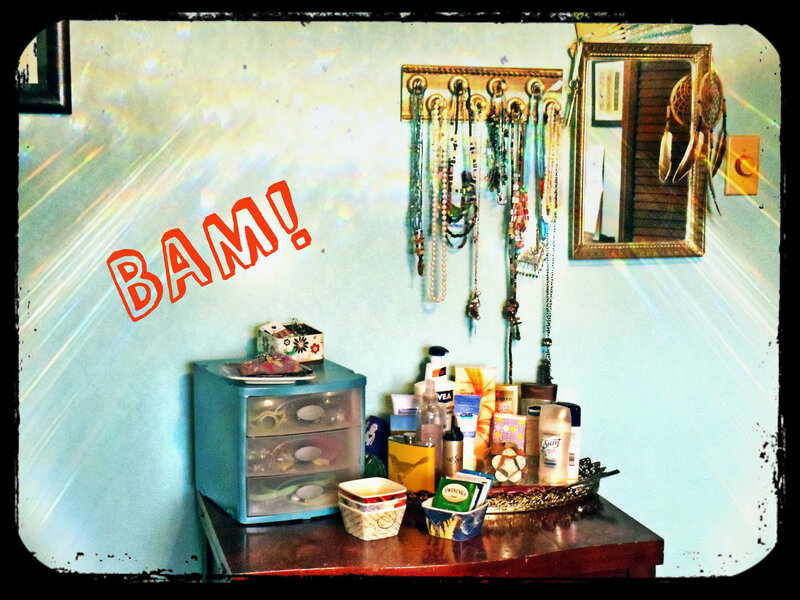 This entry was posted in Craft-ology, General Craftyness and tagged Clutter-monsters, craft, DIY by plaidpaisleyandpolkadots. Bookmark the permalink.